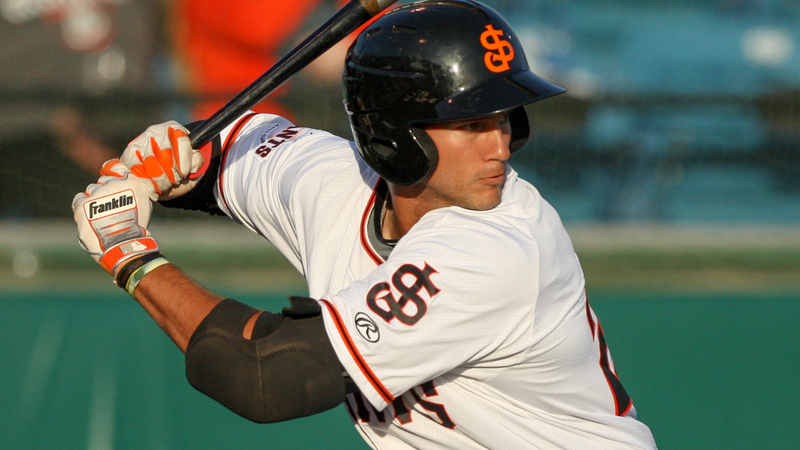 The San Jose Giants waited nearly nine years for one cycle. They only had to wait one additional inning to get a second. When Gio Brusa tripled in the eighth inning for the Minor Leagues' first cycle of 2018 and Class A Advanced San Jose's first since 2009, Jalen Miller knew history had been made. Then he realized something else. "Actually the only thing that reminded me that I was a triple away from the cycle was when Gio hit his cycle," Miller said. "I kind of thought back at the game and was like, 'Oh crap.'" Miller raced for three in the ninth to finish off his five-hit night with the identical feat as the Giants pummeled the JetHawks, 18-6, on Wednesday. "I didn't really realize what had been going on," Brusa said. "We were just all excited as a team that we were playing well, and this is just kind of the fruit of being in the moment and playing together well as a team." Miller's hit total led all players, but Brusa put his name in the record book first on his 4-for-6 night. Entering the day with just four hits on the season, the Lodi, California native belted a two-run homer to left field in the top of the first inning to cap a four-run frame for his team. In the second, Brusa drove home a pair with a single to left as the Giants tallied five runs in that inning. Brusa led off the fourth with a double to center, but entered his final at-bat of the night still missing the last component after a groundout that ended the fifth and a popout that capped the sixth. With nobody out and two on in his last trip to the plate, the University of the Pacific product ripped a triple to right that plated two, giving him six RBIs for the evening. He attributed the big day to something bigger than baseball. "Honestly, I'm going to have to say my faith," Brusa said. "Today I had a great devotional, and it was all about the verse, 'Today is the day the Lord has made. I will rejoice and be glad in it.' It's very easy to look at the big scheme of things, but it just kind of really planted me in today and grounded me to focus and enjoy each and every pitch, each up, each down, each twist and turn." Miller contributed throughout the night. The 2015 third-round pick drove in San Jose's first run of the game with an RBI single to center in the first and followed with another RBI single to right in the second, crossing the plate on Brusa's hit that inning. "Every time I looked up, I had another [at-bat]," Miller said. "Through the first three innings, I had three at-bats. We just kept it going the whole night. In Lancaster, any thing can happen even when you're up by 10 runs. Our manager [Lipso Nava] just came in every inning and said, 'We need one more,' and that's what we went out there and did." After flying out to left in the third and grounding out to short to lead off the fifth, Miller crossed the double off his list with an RBI knock to left in the sixth. He belted a homer to left-center to lead off the eighth and facing hard-throwing sidearmer Justin Lawrence in the ninth, Miller raced for a two-out triple on a line drive to left-center that Lancaster center fielder Forrest Wall missed on a diving attempt. Miller finished 5-for-7 with four RBIs. "When I got on third, no one knew that I had actually hit for the cycle." he said. "One of my teammates, [pitcher] Mac Marshall, he looked at me from the dugout and mouthed, 'Cycle?' I shook my head in a 'yes' way, and after the inning, we all celebrated. It was pretty cool." Even having two cycles in close proximity to each other is exceedingly rare. In the Major Leagues, it's only been accomplished by two players on the same day twice -- Sept. 17, 1920 by Bobby Veach of the Detroit Tigers and George Burns of the New York Giants and on Sept. 1, 2008 by Stephen Drew of the Arizona Diamondbacks and Adrian Beltre of the Seattle Mariners. Two players on the same team accomplishing it in the same game might be a first. "I've never heard of that either," Miller said. "It was pretty cool. I'm glad I got to be a part of it." San Jose's 25 hits were one shy of a club record. Seven Giants had multiple hits on the night with Sandro Fabian singling four times and Bryce Johnson and Wander Franco adding three-hit performances. "It was awesome, a lot of loud contact the whole night," Miller said. "I told Franco before the game, 'Three hits for you.' He's been hitting the ball hard right at people, and when he came back from his third hit, he looked up and I was like, 'That was three, huh?' He just smiled. It was cool to see everybody pitching in." "I just think it gives each individual a lot of confidence because you can go out there and be free and let it fly because you know the guy behind you is going to pick you up regardless," the first baseman said. "It just really gives you the freedom. I just feel like as a team, we have a lot of trust in each other and faith in each other. I think with that, that's going to go a long way for us." The cycles were San Jose's first since Thomas Neal accomplished the feat on April 28, 2009, also at Lancaster -- in a game started for the Giants by future World Series MVP Madison Bumgarner.